This is a defensive drill from Coach Larry Shyatt (former University of Wyoming Head Coach and former Dallas Mavericks assistant coach). It teaches players how to trap anywhere on the court. It also is a good offensive ball-handling and passing drill, under pressure. Setup: - Diagram 1 - use 6 players (3 yellow, 3 white) alternating around a circle. Each player takes one step back off the circle. 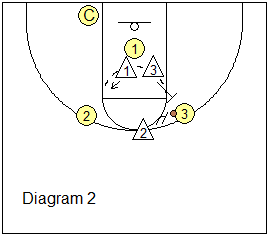 You want the players to maintain this diameter circle and spacing throughout the drill. Coach has the ball. Coach passes to any player - here O1. The adjacent opponents X1 and X3 immediately set a legal trap on O1. Trappers must have their feet wide and adjacent to each other with arms up and out. The player with the ball O1 is not allowed to dribble and tries to pass to either of his/her teammates, while the remaining defender X2 acts as an interceptor, gapping the two offensive players. O1 stays low and never puts the ball above his/her head as this would allow trappers to close in tighter. He/she uses pass-fakes and works on pivoting to make a pass. Diagram 2 - when the ball is passed (here to O3), X2 closes to trap and X3 immediately sprints out of the trap to now trap the ball (O3) again. X1 becomes the interceptor. And so the drill progresses. After a stop in play, next time the coach will pass to a player on the other team so that everyone gets both trapping and offensive work. With a 12-player team, you can run 6 on each end at the same time. You can also set the circles on different places on the court to mimic where you usually like to trap... e.g. near the endline if you like to trap off a full-court press, or near half-court for half-court or 1-3-1 trapping defenses. From "Larry Shyatt: Building a Defensive Culture"
This is a defensive drill that emphasizes defensive slides, forcing the opponent to the baseline, and then trapping at the baseline. 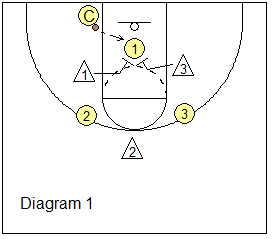 Use both sides of the half court, with an assistant holding a ball on each wing, free-throw line extended. He/she should hold the ball extended out with one hand toward the defender (X1). Diagram A. The defenders at the free-throw line (X1 and X2) slide over and back twice and touch the ball each time, being vocal ("deny, deny, deny"). On the third slide, before she can touch the ball, the assistant puts the ball on the floor and starts dribbling. The defender forces him to the baseline, where the low block defenders (X3 or X4) seal off the baseline and prevent further penetration along the line, and the two defenders trap him in the corner, or along the baseline (Diagram B). Once the assistant is trapped, the low block defender steps up to the free-throw line, the next player in line becomes the new low block defender, and X1 goes to the rear of the line. 1. Make sure the defense prevents penetration along the baseline. 2. Don't allow the ball-handler to split the trap. Trappers get "knee to knee". 3. When trapping, don't reach in. The height of the trappers' hands should mirror the height of the ball. 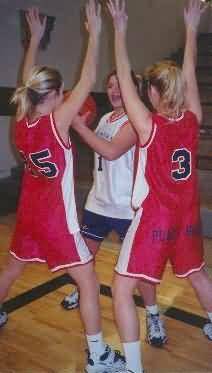 We are going for a deflection, a bad pass, a 5-second call and lastly the tie-up and jump ball. If the offensive player presents the ball to you, go ahead and get the tie-up, jump-ball... but otherwise, don't reach-in for the ball. with Larry Shyatt, former University of Wyoming Head Coach and former Dallas Mavericks assistant coach. By Tom Izzo, Michigan State University Head Coach. with Jay Wright, Villanova University Head Men's Basketball Coach.